There are some things you need to tweak in order to make app_rpt and alsaradio working as a repeater and Echolink node. The PTT is activated low and needs very low current to be activated. I measured about 140uA needed current for activating PTT. The SQL signal (which sometimes is called COR – Carrier Operated Relay or COS – Carrier Operated Squelch) is activated high but it can only drive small current (uA) and therefore a transistor needs to be used to drive the serial line. That is why one will need an additional power supply if driving optocoupler is needed in an isolated interface (I’ll present it later on). You could see that the DATA connector has DATA IN, DATA OUT 1200 and DATA OUT 9600 pins which could be used to input/output audio when no digital modes are used. However, DATA OUT pins do not output squelched audio. 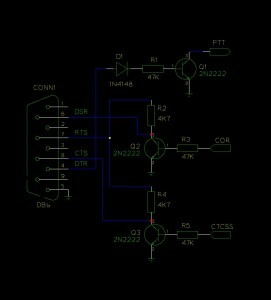 Hence I used only DATA IN for audio input and oudio output has been taken from oudio output jack in the back of the rig. It will record the input level while showing ameter levels. You should adjust input level either from your card controls or from your rig’s volume level to see a 3/4 from your maximum ameter level. To adjust output level you need to set your rig to display modulation level. Then adjust your card output level so that the modulation level is what your rig’s manual says (On FT-857 you should see couple of bars at maximum). All of the above DTMF sequences are configured in the rpt.conf and you coud add more, see app_rpt documentation. The Echolink numbers are prefixed with digit 3 and padded with 0 until 7 digits. The IRLP node numbers are prefixed with digit 4 and no padding. In the previous article I explained just few bits about Asterisk and app_rpt and how I came to the conclusion to build another channel driver for app_rpt. The idea behind is that I wanted to make a channel driver that uses a general purpose sound card for media path and serial port for signaling. If the card has a driver for Linux then ALSA (Advanced Linux Sound Architecture) will provide an abstraction of it so that the channel driver will not depend on the specific sound card type. 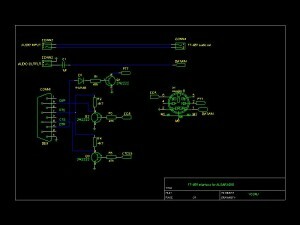 It does not use the right levels for RS232 interface but it will work with the serial ports of modern computers as long as the PTT and COR are not stressed with high data rate (this is unlikely anyway). 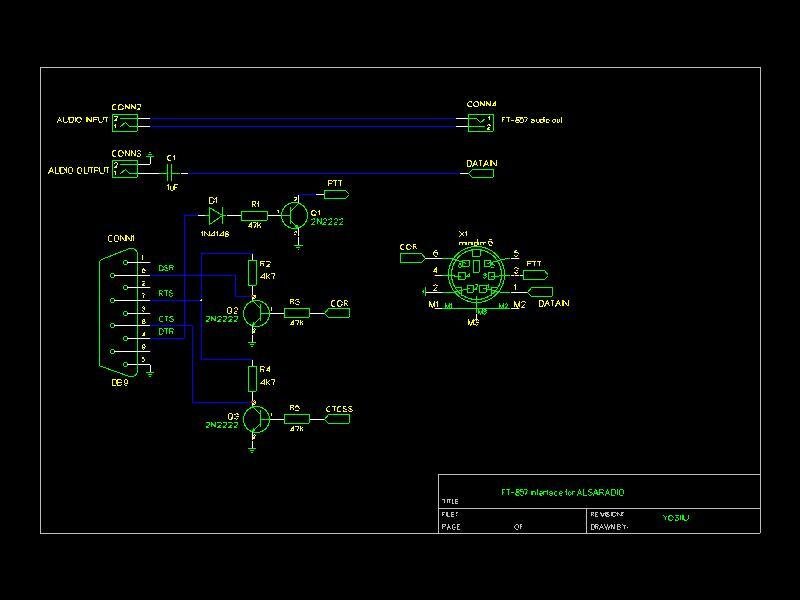 I will provide later on an interface that will make use of optocouplers for isolation of signals and audio transformers for isolation of media path. Audio signals (media path) are connected form the audio output of the rig to soundcard input and from soundcard output to rig microphone input. You should use appropriate values for your input_device and output_device parameters according to configuration of your sound card. I will explain later about how various nod numbers could be dialed using DTMF commands. Couple of months ago I’ve been looking for open source software that a radio amateur could use. I came across app_rpt that is an application for Asterisk with many many interesting features. What is Asterisk then? Asterisk is an open source telephony software that knows many telecom protocols, SIP, MEGACO, IAX (Asterisk own VoIP protocol) just to name a few. In Asterisk one can distinguish applications and channels although from programmer point of view there is no difference, both being shared libraries. Channels are the ones used to get or to send calls to/from Asterisk although Asterisk does not distinguish between FXO (Foreign eXchange office) and FXS (Foreign eXchange Station). Applications could do whatever they want with data gotten from the channels it connected to. Looking at the features Asterisk provides one could imagine at least couple of use cases for Asterisk and its usage in ham radio. Basically the Asterisk could be seen as a PBX able to communicate with other exchanges via various physical links and protocols while locally it can be connected to a radio station. – CM108 chip USB soundcard with some GPIO pins for signalling like PTT, COR, CTCSS decoding. My situation is that I do not own any of the hardware that app_rpt is able to work with nor able to buy them easily. Therefore I decided to implement a simpler interface for my radio station based on ALSA and use serial port for signalling.